Data Security and Data Protection are imperative for industrial paper shredding services to operate and for the customer they provide for. These shredding specialists must maintain this security and the potential breaches that can occur. The vertical strip shredding technologies have been proved not to securely destroy your data beyond reconstruction. Just as communication technology has truly advanced significantly, data reconstruction technology has also come a long way since the introduction of the office paper shredder. These reconstruction capabilities have increased the need for Organisation to avail of a paper shredding Ireland service. The professional onsite confidential shredding service vendors use cross cut shredding technology that is virtually impossible to reconstruct. The more secure shredding vendors that are registered with The Data Protection Commissioner and are Data Processors will use a double cross cut technology that creates a particle shred that is impossible to reconstruct currently. Time within all working environments is essential to be managed closely and efficiently with good time management practices in order to keep the positive developments happening within the Organisation and perform well against competition. It has been researched and estimated that it takes an employee an average of five hours to securely shred twenty-three kilos of sensitive paper material and the risks of a data breach is at its highest. A confidential shredding service is about risk minimisation and having employees complete the confidential shredding service in-house is high risk as there are issues relating to confidentiality, health and safety, efficiency and training just to name a few. How much will an Organisation No.1; pay that given employee for those five hours and No. 2; what financial losses are being made by that given employee not carrying out other core productive duties for the Organisation. Not all paper data is simply sheet of paper. Much of the paper data may be in folders, boxes, files, clip boards and staples to name just a few. Through the professional confidential shredding service, you will receive a shredding service that utilises specialist technologies that in turn can securely destroy all forms of paper data inclusive of the above listed items. Many office shredders cannot shred staples or multiple pages simultaneously which turns a what should be fast and efficient job into a long and tedious task. This makes the task become a high risk task for an Organisation as you are wholly dependent on your employee’s patience threshold. Not only will it be a higher expense on an Organisation with employee time required it also means shredding is put to the bottom of the “to-do” list and potentially sensitive documents are left unsecured and possibly enter general recycling. In the event of a data breach or privacy violation, it is likely that your business will receive and confidential shredding service audit and will be asked to provide proof that the information was securely destroyed. By using an in-house office shredder, this simply isn’t possible but a credible third party should always issue a Data Processing Certificate which certifies that all of the data was destroyed and recycled in line with European Legislation. If your Organisation’s data shredding is delegated to the office junior which results in sensitive data and confidential information being passed through their hands you are leaving your Organisation at high risk. The same applies every time that you send data to be printed, scanned and photocopied; all of this sensitive data is passing through the memory of the given device and it is essential (and many forget) to securely destroy all data carriers such as hard drives, SDD cards and USB keys when upgrading a computer system. 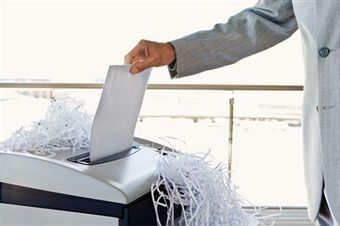 A confidential shredding service Ireland is the only way to guarantee total destruction of your digital data. Yes, there are other methods of “wiping” hard-drive which simply puts that hard drive in an atmosphere where magnetic pulses and pulsed at the unit and in turn the data is “corrupted” however the data is still on the drive and that is the simple reason why people selling those kinds of confidential data destruction services will not and cannot guarantee destruction. Visit www.securityinshredding.com for more information.